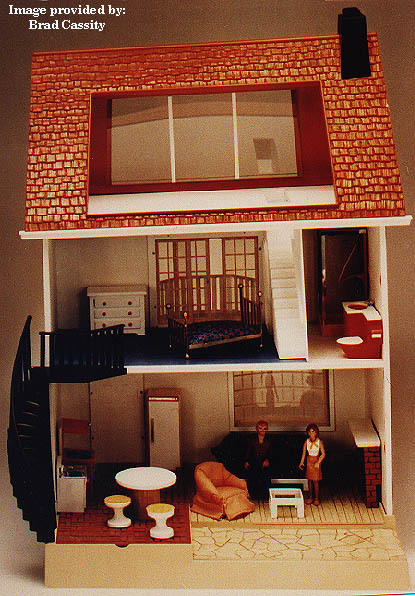 The very first dollhouse introduced by Fisher-Price was the #250 Doll House in 1978. The accessories and figures are slightly larger than the scale of the figures used in the Adventure Series line (click here for the Adventure Series People ID). In 1985 Fisher-Price gave the doll house and doll house accessory sets a "face-lift". Two seperate houses were introduced in 1985, the #4400 Fisher-Price Deluxe Lighted Doll House with Furniture, and #4300 Fisher-Price Doll House. These two one-year-only sets would be the last doll houses that Fisher-Price made until 8 years later at which time Fisher-Price introduced the pre-assembled #4600 Dream Doll House. For a list of all Fisher-Price dollhouse sets in order by model number, click here. The 1993 Dream Doll House, figures, and accessories are much larger than those sold from 1978 to 1985, click here for a photo. 1993-1999 doll house figures and accessories are NOT compatable with doll houses and accessories sold from 1978 to 1985, and vise versa. For that reason, we have divided our Fisher-Price Doll House Identification into 2 different sections: one that lists all of the accessories in alphabetical order that were sold in 1978-1985, and one that lists all of the accessories sold in 1993-1999. The number of doll house figures and accessories sold from 1993 to 1999 signifigantly dwarfs the number of figures and accessories sold from 1978-1985. Although Fisher-Price still makes doll houses and accessories today, we have only listed the sets and accessories sold up to 1999. In 1999, Fisher-Price changed the design of their doll house figures and accessories. The figures, pets, and accessories are all far more detailed than those sold from 1993 to 1998.